The Occluded front which dumped a months worth of rain in a day on Coningsby refused to clear away from West Cornwall on Tuesday 16th May. It lingered all evening giving Cornish Mizzle with limited visibility. The Race Officer Andrew Laming positioned the committee boat in the vicinity of Trefusis for an average Southerly wind. Wisely he set a Race officers choice course due to the uncertainty of the wind and the visibility. Governor to port, West Narrows to port, North Bank to port for all 24 competitors. M, Q, V and U class two rounds and finish off the club line. B, G and W class one round and finish. Q class were first away with 7 competitors. The pesky wind had shifted west just before the start and the committee boat end was very crowded. Temeraire, Martin Eddy got the best start with Jackdaw, Bob Warren close behind. The fleet were all but making Governor in one hit and there were some big gains and losses to be made as the wind came and went with massive 20 degree shifts. U class lined up and again the committee boat end was very crowded. Bob Chapple in Wilkie luffed up Mandy Owens, Aurora, who in turn luffed up Chris Jelliss in Trifle. Mash Derrick helming Levity soon found out that the big old timer, (Levity, not Guy English! ), did not respond like a GK24. He came accross the fleet at right angles from the starboard side and left a hole between him and the committee boat. Never to be one to miss a sailing opportunity we slipped into the hole and started with a few milliseconds spare on Trifle. 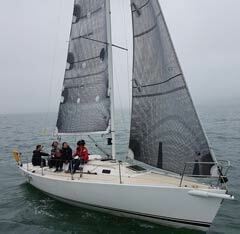 V class fielded 3 boats having recently come out of hibernation. Started then Len Cheshire in Sweet Friday, he is getting a “Billy no mates” complex, had his W class start. The Puffin crew did not want to shrink their oilies? Next in line were 2 G class boats and last but not least 2 B class-working boats. I think Arthur Williams and Dan Tregaskes are holding the torch for the WB this year! The visibility was poor and the wind asked more concentration on helming so my perspective of events narrowed more than usual. In Trifle we approached the Governor and could see the Q class yachts coming away from the bouy with starboard pole kites. We had tacked onto port to lay the mark and encountered Orijin, Andy Dennis coming down with a massive blue asymmetric also on port. He went high and over the top of us. We made the mark, tacked and hoisted kite with a twist. Soon sorted and kept high on West Narrows as the flood tide was drifting us ever faster to the left of track. A gybe onto port pole and stay in the tide heading slightly toward Vilt and then ease away to North Bank. A windward takedown kite drop and the start of the second beat to Governor. We saw the majority of the Q fleet stand on port tack towards Trefusis to stay out of the flood tide. Two boats tacked early and went up tide one of whom was Encore, David Cunliffe. We decided to stand on port and then halfway between North Bank and Trefusis found a big header and lots of breeze. We tacked onto starboard and got a massive lift toward Governor. Jon Fox in Excelle did the same and it certainly paid off for both of us in the end. 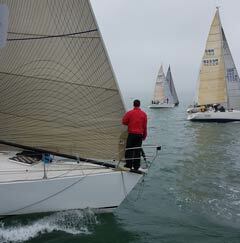 A quick tack over to port and then into the wind band saw Trifle first at the mark. Jon Fox, Excelle was first in IRC Q class with Martin Eddy, Temeraire a close second by 13 seconds and John Hicks, Rampage 44 seconds later all on corrected time. Trifle, Chris Jelliss was first in IRC U class with Aurora, Mandy Owens 7 minutes and 20 seconds, corrected to 3 minutes 13 seconds next. Wilkie, Bob Chapple some 5 minutes ahead of Aurora was beaten into 3rd by 10 seconds corrected. 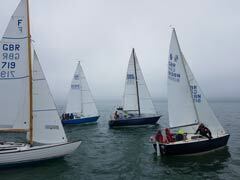 Roger Ford came first in Audry V class with Saucy Sally, John Lowry second and Mary, Neil Hopkins 3rd. Clementine, Perham/Franks beat Miss Agnes, Mike Rangecroft in G class by 3 minutes 8 seconds corrected in G class. Arthur Williams in Winnie beat Dan Tregaskes in Grace by 51 seconds corrected in the WB B class. The full results i.e. Byron and the Series are all available on the web as my fingers are failing. Thanks to the Race Officer, the committee boat staff and Charles Choak, who helmed the committee boat. Giles for transporting us. Jeannette in the ops room. Malcolm results, the caterers and the myriad of bar staff who served us delightful beer.